“Create your own music video for “Push And Shove” during the band’s Seven Night Stand at The Gibson Amphitheatre! Get together with two or more of your friends and create a music video for “Push And Shove” during the LA shows using the Vyclone App. Capture your entire experience before, during and after the event, intercut with live footage of the band performing. The winning video will be featured on NoDoubt.com and all team members will receive Push And Shove prize packs! 1.) Download the FREE Vyclone app from iTunes here and register. 2. Press Record in the camera when No Doubt play “Push And Shove” and Vyclone connects you with other people around you, then automatically sends back an edited movie. 3. Remix the movie to your liking and submit it to Vyclone. The video with the most likes will be featured on NoDoubt.com and all of the team members will receive Push And Shove prize packs. The UK’s The Telegraph has posted a great new interview with Gwen. Read it here! “To the listener, the main change between now No Doubt released the album “Push and shove” and No Doubt did successfully for nearly two decades is in the sound: melodic ska of “Tragic kingdom” (1995), which sold more 16 million copies, now share space with influences from contemporary electronic music. By the reckoning of the musician, the four members of No Doubt have added up eight children.Two are of Gwen Stefani, the lead singer, married to Gavin Rossdale of Bush. According to Dumont, current life on the road is harder to Gwen than for their partners. He says even though the letters are still written by the singer. In “Push and shove,” however, Tony Kanal (bass) started to help in the composition of verses. “Although the story of the two, they really have a great working relationship, with much respect,” said Dumont. Gwen and Kanal dated for seven years before the fame. The termination of the relationship is the main theme of banda hit, “Do not speak.” The guitarist says that the reception of “Do not speak” the label did propose that the quartet to record versions in other languages, such as Spanish and Portuguese. Fearing sound pretty authentic, No Doubt refused. Read, then, the main parts of the conversation. G1 – Gwen said “push and shove” is the record of your life. Do you agree? Tom Dumont – Well, I think that whenever we make a record, we think it is the job of our lives(laughs) . Funny thing, this disc is that, when finished recording, mixing and mastering, I was so bored, I could not hear him anymore. I was not listening for about a month. But after that, I had to make a trip an hour drive to Los Angeles, and I thought to myself: “This is my chance, I’ll hear it again, open-minded and like the first time.” Then I heard, from beginning to end, and I felt really good, proud. I think we did a great job. Tom Dumont – Wow! It is this: we are the same people, there is a lifetime in those 15 years.The biggest difference in our lives is probably the fact that we have become parents. Having children is not very rock’n’roll (laughs) , but the kids really come first now. Today the children come before the rock. Music and No Doubt have been really an escape. We have two lives, you know? G1 – How many children do you have in total? Tom Dumont – I think eight. It’s a gang (laughs) . The kids are awesome, everyone is always playing together, are friends. But the hardest part is with Gwen because she is the mother. She has two little boys, who go with her to every corner, because they need the mother – and she must be a mother first. This is the most complicated thing for her. G1 – Many fans of No Doubt walked praising the fact the band have changed little over the years and good way to Gwen, who does not seem stale. What do you think? Tom Dumont – This is something funny about us. Looking back at our history, I see that this has always been true. We have this terrible fear of repeating ourselves. At the time of the “Tragic kingdom”, he had incredible success – with “Do not speak”, “Just a girl” and other singles. I think we always change. The difficult thing about this is that some fans want the band still sounds sounded like 15 years ago – and are disappointed. Moreover, we feel we must move forward, we do not want to stay stagnant. G1 – The way you work together changed in this new album? Gwen continues to write lyrics? Tom Dumont – Yes This disc was a little different. In the past, most stayed with Gwen, and she worked hard in the lyrics with Tony. It was a novelty. The truth is that Gwen is still writing songs about her life, about their emotions, feelings, observations. And Tony, instead of bringing ideas to the songs, helped with … more [After short pause] With the grammar, with descriptions. But it’s still the life of Gwen – she’s not singing about the life of Tony, you know (laughs) Although the story of the two, they really have a great working relationship, with much respect. It’s great to see them so. G1 – The lyrics of “Do not speak” is very personal, but it became a hit in places where people do not speak English. Imagine why? Tom Dumont – (Laughs) The way this works has always intrigued me. This is a question you can answer better than me. You, who speaks Portuguese, while listening to a song in English, translated the letter or just understand the emotion of the tunes? Tom Dumont – The funny thing is, “Do not speak” became a huge hit around the world and even proposed label: “If you could rewrite in different languages – like Spanish , Portuguese – maybe you do not sell more records … “. Do not pretend to be authentic sang in different languages.There was not respected because other countries, it was not because we wanted to strive to be something we were not. At the beginning of the band, especially during the “Tragic kingdom” and in late 1990, curtíamos really travel to many place as we could. We were excited by the fact that people can sing our lyrics. G1 – No new record, you tried to modernize the sound of No Doubt? Tom Dumont – Yes We were inspired by the music of the past and what is happening in music today. “Push and shove” [the title track] is a crazy music at the verses there is a dance floor beat, somehow has a medium tempo house. But at the same time, it sounds like a very old ska 1960s. And then comes the chorus crazy. We started hearing some music to inspire us and realized we had something close to dubstep there. Just a little. But is not that we wanted to make dubstep or something. I think it’s fun to take elements of things we found there. I do not know how people will react to this, but we love. Tom Dumont – The culture has changed – and completely changed the way people listen to music. It’s true. When we were young, it was expensive to buy CDs [When buying] I listened to each track a hundred times, read all the letters of the booklet. Nowadays, it seems that nobody buys. People hear on YouTube, the Internet. The fact is that we do not want to go back to what we were before, technology is always progressing. But today is in the 1990 or more old, the music has to be good by itself, to make someone want to hear it. G1 – In an interview, you said you practiced guitar for long hours, and who now only picks up only when the instrument is inspiration. The song would become a pleasure, and not an obligation. When you realize that? Tom Dumont – Bands like Iron Maiden, Judas Priest, Rush, hard rock, anyway. Kiss, of course.Then, as a teenager, I was very interested in the technical skills demanded that the guitar, or how it could play as fast as Yngwie Malmsteen. I tried very hard to play that way, read magazines on guitar, practicing eight hours a day. But at the time I entered the No Doubt when I was about 20, I realized I would never be like Yngwie Malmsteen, or as good at that level. I realized that music involves much more than that. It involves emotions, stories that are told. I focused on melodies – I was good enough as a player to do what he wanted. It was a change of focus. The No Doubt helped me get to this point. G1 – Do you intend to come to Brazil? A single visit was 15 years ago. Tom Dumont – I actually have a good friend who is Brazilian. He now lives in Sao Paulo, because of work, but lived in Long Beach for 15 years. We were talking about me visit him at the Olympics [in 2016], but I hope to come back and play with the band before that (laughs) . G1 – His fans also believe. Your friend showed you something about Brazilian music? Tom Dumont – He likes the same things I do, hard rock, AC / DC, Iron Maiden, you know? G1 – What are your memories of that trip to Brazil in 1990? videos, Gibson photos and set list, etc. I’ve added photos from the AMAs, as well as from last night’s show at the Gibson Amphitheater to the gallery. This limited run of high-end art prints of the album’s cover paintings will go on sale at 9:00 AM Pacific on Monday, November 26 via the NoDoubt.com webstore. The print was specifically overseen and prepared by the original artist, the acclaimed EL MAC. Limited to one print per order. Don’t miss your chance to own your piece of No Doubt history! 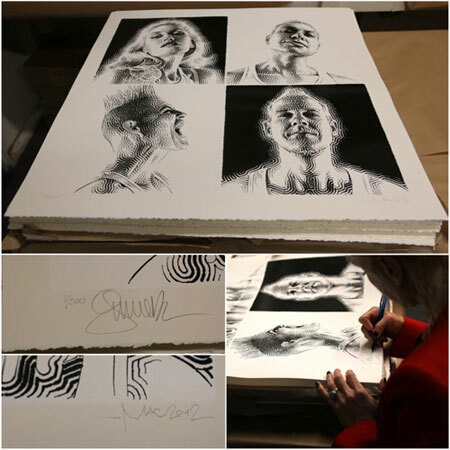 – Limited edition of 500 prints, each hand numbered and individually SIGNED BY EL MAC & GWEN, TONY, TOM AND ADRIAN. – 27″ x 27″ large format print. – A multi-layer ink process was used to create a textured print incorporating a white matte background, a graphite/metallic black (with some “sparkle”) and a raised clear gloss finish. – Printed on high-end archival fine art paper stock – 80# Stonehenge paper, deckled edge at bottom. – Prints will ship rolled in a poster tube with a paper liner to protect the print. “The members of No Doubt have signed and donated a Hamer guitar to “The Ronnie James Dio Stand Up and Shout Cancer Fund.” The guitar will be auctioned live on Saturday, December 1 at 2PM PT and you can bid in person at Julien’s Auction House OR online atJuliensAuctions.com. In a new article posted on contactmusic.com, Gwen talks about how she doesn’t like to listen to Return Of Saturn, because it reminds her of a dark period in her life. This seems to be an excerpt of an article in the December issue of Attitude magazine, of which EIT has posted scans here. “Gwen Stefani can’t bring herself to listen to No Doubt’s 2000 album ‘Return of Saturn’ because it reminds her of a traumatic time in her personal life.Gwen Stefani can’t listen to No Doubt’s ‘Return of Saturn’ album. The singer says it was a painful time working on the 2000 LP as her personal life was in a mess so she can’t ever being herself to play it again. Talking about why the band put a birth-control dispenser on the cover, Gwen said: ”That was ’cause I was thinking, ‘Am I gonna have a baby? Am I gonna be married?’ It was a really nasty time period for me. I can’t listen to that record. Ever. Gwen – who now has two sons, Kingston, six, and Zuma, four, with husband Gavin Rossdale, who she married in 2002 – admits a lot of the songs on the album are very ”self-indulgent” though she is proud of some of her writing on the record. Hello! I’ve added a video of No Doubt’s awesome performance of “Looking Hot” at the AMAs here! “The last time Californian pop superstars No Doubt unveiled an album, Apple was also launching its new gizmo – the iPod. The fact that the 11 years between the release of 2001’s Rock Steady and this year’s comeback album, Push and Shove, is a long time in showbiz is not lost on No Doubt guitarist Tom Dumont. “It’s so crazy to think of how everything has changed since then,” he says from London, where the quartet were on the promotional trail. “Even though the technology and the way people listen to music is different . . . the thing that remains the same is that the songs have to be good. The songs have to be compelling, so they’ll touch people and move people emotionally. An even bigger impact on the creation of Push and Shove is the eight children the four members have had between them since Rock Steady. In particular, Gwen Stefani’s two children with rock star hubby Gavin Rossdale have meant the band is no longer top priority. “In the old days, we used to do 12-hour days in the studio,” says Dumont, who has kids aged 6, 4 and 20 months. “We used to tour for months and now it’s all scaled back, especially for Gwen because she’s a mum and she’s got to be there for her kids first. “I really admire her for doing that. It would be easy for her to escape her responsibilities but she really doesn’t, she’s really there . . . she’s a mum first and then a singer second. The juggling act that Stefani performs to balance the needs of sons Kingston, 6, and Zuma, 4, with her career is reflected in the new album’s lead single, Settle Down. Like most of Push and Shove, the track was written with bassist, keyboardist and her former beau Tony Kanal – she wrote 1996 mega-smash Don’t Speak about the demise of their seven-year relationship. No Doubt started work on Push and Shove four years ago. After struggling to write songs they were happy with, the band hit the road in 2009, playing 58 shows before returning to the studio with a fresh approach. “In the old days we definitely would write 20 or 30 songs and pick the best ones,” Dumont says. “Once we got rolling on a song, instead of scrapping it if it wasn’t good enough we would rewrite and rewrite and rewrite. “There were songs that we rewrote the chorus three times, trying to get it right. There were songs that we re-recorded two or three times in totally different approaches to try to get it right. There are exactly 11 new songs, without any spare for tour edition CDs or iTunes bonus tracks. And only one song on Push and Shove comes in under four minutes. Push and Shove should also please fans – the infusion new wave, reggae and rock into radio-friendly and hook-laden pop picks up where Rock Steady left off. The band injects enough fresh ideas, particularly via the title track which features DJ/producer Diplo in his Major Lazer dancehall guise. “We always will want to move forward. We hate repeating ourselves,” Dumont says. “But at the same time we have all these fans that love us for the sound that they’ve grown up on with No Doubt. Hello! No Doubt just tweeted that they’ve officially been nominated in for a People’s Choice award in the “Favorite Band” category! Woohoo! Please vote for them here! The awards air on January 9th. “PeoplesChoice.com – The main voting hub is sitting pretty right on this very website! Click around to all of the different categories and make sure you vote, vote, vote! Facebook – If you’re anything like us at the PCA HQ, you’re on Facebook 24/7 anyway. So if you can’t make it all the way over to PeoplesChoice.com, head to our official Facebook page (Facebook.com/PeoplesChoice) and vote right there. You can personalize your page, share votes with your friends and even RSVP to the People’s Choice Awards on January 9! Twitter – Talk about sharing your votes, how about TWEETING your votes! Like the last few years, we have once again enabled voting on Twitter. It’s super simple and a great way to show support for your favorites in movies, music and TV: After voting on the web or Facebook, you’ll be asked to “Tweet your vote.” Once you choose that option, you will automatically cast a second vote through your twitter account. Best of all, retweets count too! Mobile Apps – Everyone please help me welcome our brand new iPhone and iPad voting apps! In addition to the Android app that was introduced two years ago, the iOS apps let you vote for the 2013 PCA winners, check out red carpet and backstage photos & videos and vote in our daily polls – all on your handheld! So if you find yourself out of the house and wanting to vote on the go, head to the App Store or Android Marketplace and download this FREE app now. “”Restore the Shore” will air live on MTV tonight at 11 p.m. ET, and will feature appearances by the cast of “Jersey Shore” from MTV’s Times Square studio, as well as cameos by other celebs all of whom will be asking viewers to contribute to the rebuilding and restoration of Seaside Heights. But you don’t have to wait until then to help out: Text SHORE to 85944 to make a $10 donation now. Funds will focus on meeting the immediate emergency needs of Seaside residents, such as shelter, food and health services. The Red Cross is also helping feed emergency workers, handling inquiries from concerned family members outside the disaster area, and providing blood and blood products to victims. I’ll capture it, and add it to downloads tomorrow after I get out of work. “The Windows Phone 8 ad campaign kicks off today with spots featuring actress Jessica Alba and singer Gwen Stefani. Take a look and tell me what you think. It’s already started airing on TV! Edit: The Looking Hot lyric video has been posted here! I’ve added a bunch of photos to the gallery. Apparently Gwen will be featured in some ads for the Windows 8 phone. Check it out! Hello! No Doubt has just performed “Looking Hot” at the European Music Awards. EIT already has a video up here! It doesn’t air where I am for another 6 hours, so I’ll have my video up tomorrow. I’ve added the June 27, 2002 Brixton Academy show to the videos section! “Settle Down” is nominated in the “Best Video 2012” category of the UK’s 4Music Video Honours! Click here to vote for No Doubt! “No Doubt are set to make their debut at the 2012 MTV EMA in Frankfurt tomorrow night (11th November) – with the reunited rockers exclusively telling MTV News that fans are in store for a ‘straight forward’ classic performance. While leading lady Gwen Stefani may have graced the EMA stage as a solo artist before, this time, she will be joined by fellow No Doubters Tony Ashwin Kanal, Adrian Young and Tom Dumont for the first time at the Festhalle for this year’s event. The 2012 MTV EMA will air live from Frankfurt’s Festhalle on Sunday, 11th November at 9pm only on MTV! Don’t miss it! “And in a strange quirk of fate, James has just landed one of the most lucrative gigs of his life — as one of the faces of Microsoft’s new mobile phone. His Gavin & Stacey character Smithy would be impressed. You are currently browsing the Greener Pastures – a No Doubt fan site archives for November, 2012.